Announcing the first annual frozen fruit seminar in Morocco. The seminar will take place on April 3, 2019 at the Lixus Beach Resort hotel in Larache, Morocco. This will be the first annual conference solely dedicated to fruit enhancement. 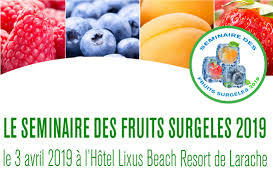 Experts in the market, such as Clauger, JBT Corporation and Tresh, will share their innovative solutions with actors involved in the production and improvement of fruit.